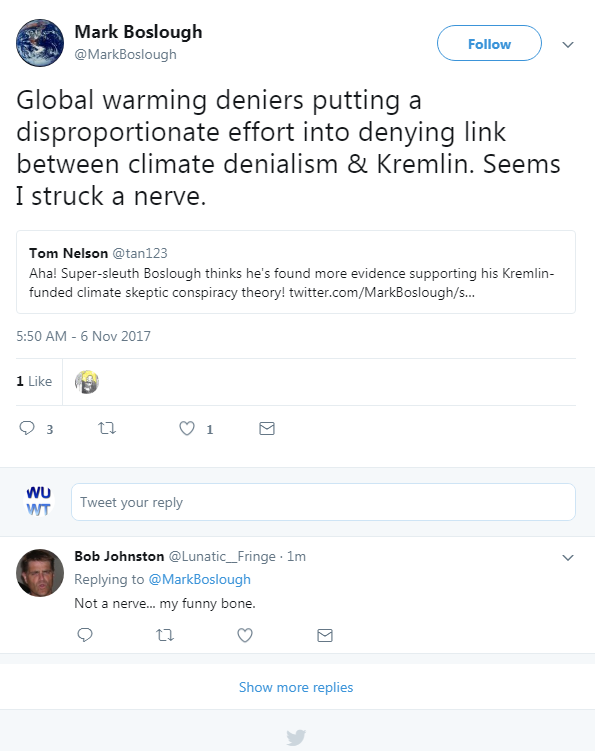 Monday Mirthiness – ‘Russia caused Climategate’ | Watts Up With That? Boslough is the chairman of “Asteroid Day”, which occurs yearly on the anniversary of the 1908 Tunguska impact in….drum roll….Russia. 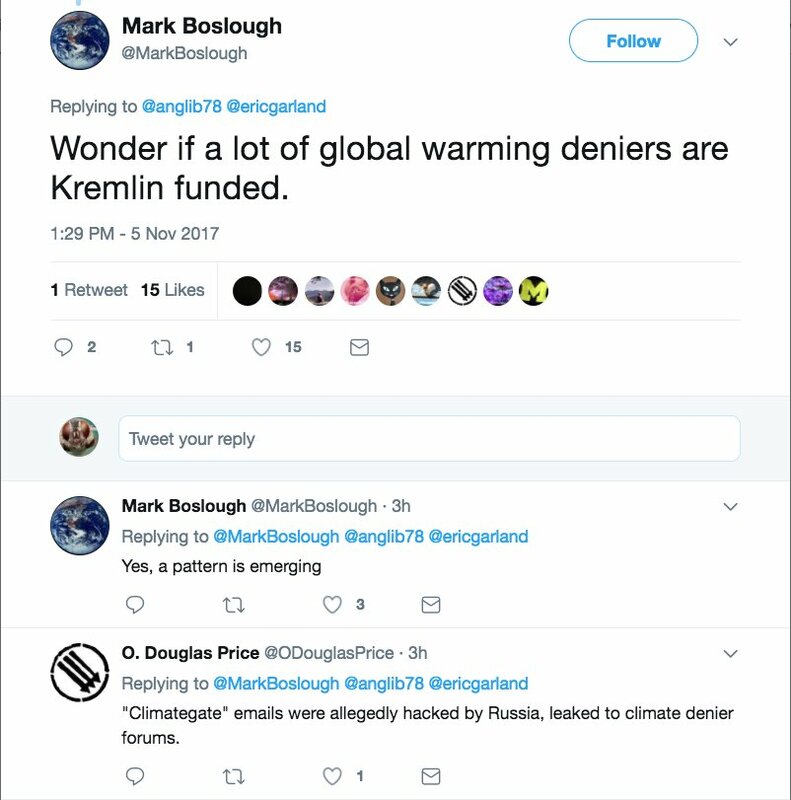 While I agree with his goals there, because I’ve said before that an asteroid impact event is a far greater threat to the planet and humanity than than “climate change”, you have to wonder how somebody as intelligent as Boslough can fall victim to such wild conspiracy theory. 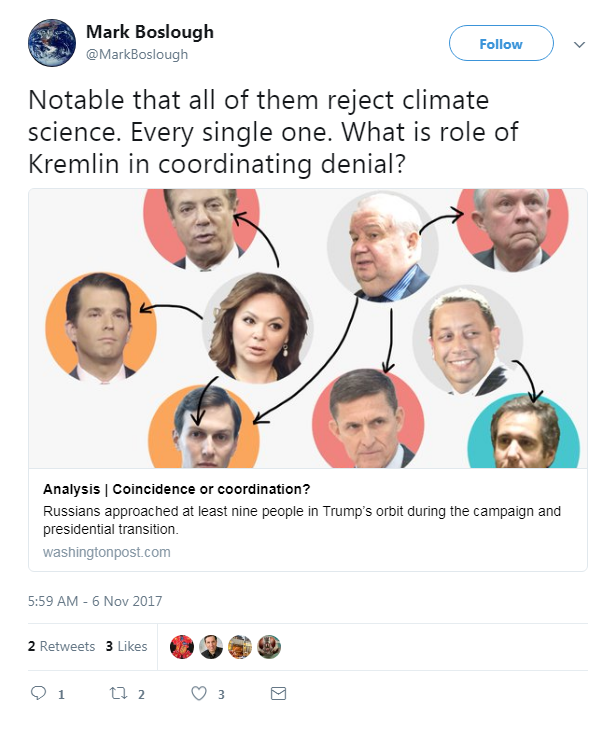 The derangement over “Russia” in nearly everything political these days (and climate change is no longer just about science, it’s highly politically charged) [seems] to run deep in the left. They can’t seem to logically reconcile that Hillary Clinton lost the Presidency on her own merits (or lack thereof) so it had to be “Russian meddling”. Climatgate started right here on WUWT. And our own Charles the Moderator and Steven Mosher were the first ones to receive and view the files. They were also in contact with the person who left the files from the University of East Anglia of a Russian “dump” server. Oh gosh, that’s it a Russian Server. I was in Europe at the time, and I asked them to wait until I got back before releasing any of the files publicly. We had to confirm their authenticity first, and I was concerned that if they were made public, I might be stopped during my return to the USA. Steve McIntyre summed it up in the Mosher Timeline under the section: “The dog that didn’t bark”. Once I cleared customs in Dulles, I sat down with my laptop and wrote the story that broke the news. On 19 November an archive file containing the data was uploaded to a server in Tomsk, Russia, and then copied to numerous locations across the Internet. An anonymous post from a Saudi ArabianIP address to the climate-sceptic blog The Air Vent described the material as “a random selection of correspondence, code, and documents”, adding that climate science is “too important to be kept under wraps”. That same day, Stephen McIntyre of Climate Audit was forwarded an internal email sent to UEA staff warning that “climate change sceptics” had obtained a “large volume of files and emails”. Charles Rotter, moderator of the climate-sceptic blog Watts Up With That, which had been the first to get a link and download the files, gave a copy to his flatmate Steve Mosher. Mosher received a posting from the hacker complaining that nothing was happening and replied: “A lot is happening behind the scenes. It is not being ignored. Much is being coordinated among major players and the media. Thank you very much. You will notice the beginnings of activity on other sites now. 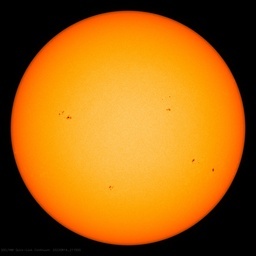 Here soon to follow.” Shortly afterwards, the emails began to be widely publicised on climate-sceptic blogs. On 20 November the story emerged in mainstream media. Readers may recall that Steve Mosher was instrumental in figuring out who dumped a bunch of files into the media in Peter Gleick’s “Fakegate”, where a forged fie was given to the media to make it look like climate skeptics were employed by the conservative think tank The Heartland institute, among many other claims. Mosher [figured] out it was Gleick who did it, and a forensic analysis of the writing style by a court-level writing expert using a computer analysis of writing patterns pretty much confirmed it was Gleick who did it. Similarly Mosher, Charles, McIntyre and I have spent quite a bit of time trying to figure out the identity of the [Climategate] leaker. It is clear to us that even though the FTP link was to a Russian “dump” server, used to host all sorts of pirated files like software and games, that was simply a way for the person to separate themselves geographically from the source of the files in the UK in East Anglia. This isn’t particularly sophisticated, hackers and gamers do this all the time to cover their tracks when they post illegally pirated software. These are called “warez” servers. Mosher spent a lot of time looking at the wording of the communications from the leaker, and the opportunity. He’s identified a person, and while I won’t share the name here, I can tell you it’s a person at UEA, not in Russia. Long-time readers may remember when McIntyre and I were toying with the folks at UEA over the Yamal and HadCRUT files. You see, the server security was so bad at UEA, that McIntyre discovered one critical file he was seeking via FOIA was just lying on their server in plain wide-open FTP public sight. Once it was discovered that McIntyre had the file, the folks at the Climate Research Unit at UEA started thinking of nefarious methods, like hacking rather than their own incompetency. To help that along, I wrote a satirical piece on the imagined Mole at UEA. What was really going on was that I had public FTP access to the file on the UEA server, just like Steve did. Readers may also recall another article I wrote, post Climategate where it was discovered that the director of CRU, Dr. Phil Jones, was so computer un-savvy, that he couldn’t even plot temperature trends in Excel. Canadian network engineer Lance Levsen after detailed analysis showed, convincingly, the source was someone within the university. He concluded, “For the hacker to have collected all of this information s/he would have required extraordinary capabilities…to crack an Administrative file server to get to the emails and crack numerous workstations, desktops, and servers to get the documents.” Access to the files is a major hurdle, but once inside there is a bigger challenge. Which files do you select? Whoever released the files knew which ones were significant. This required considerable knowledge of climate science as well as the politics and machinations of the people involved. A comment posted on Anthony Watt’s web site encapsulates the problem. “It would take a hacker massive amounts of work to parse through decades of emails and files.” The commenter suggested a different scenario that involved hacking a single file. Such a file would exist because of “an ongoing process of internally collating this information for an FOI response is entirely consistent with what we find in the file.” The problem with this argument is that the emails appeared in November 2009, at which time both the CRU and the University of East Anglia were rejecting all FOI requests. In January 2005 Phil Jones “states that he will be using IPR (Intellectual Property Rights) to shelter the data from Freedom of Information requests.” In an email on August 20th 2008, Prof. Jones says “The FOI line we’re all using is this. IPCC is exempt from any countries FOI – the skeptics have been told this. Even though we (MOHC, CRU/UEA) possibly hold relevant info the IPCC is not part our remit (mission statement, aims etc) therefore we don’t have an obligation to pass it on.” It is unlikely anyone did much work preparing files to answer FOI requests. Even if they did, files for an FOI request are different from those required to expose corruption and still required selection. Bottom line: lax security, combined with UEA’s own FOIA refusals, likely caused the FOIA officer to leave a file with the emails (that he gathered for an anticipated FOIA release) left in the open on the server, and it was accessible [within] the UEA network. Our leaker, the person with the opportunity and the means, saw the file, and realized what a hot potato he had, and dumped it on the Russian Warez server. Then he made anonymous postings using a proxy server on various climate blogs to advertise the availability of the file. It was simple obfuscation using publicly available tools and apparently effective enough that the Norfolk police never figured out his identity, and closed the investigation. This isn’t James Bond MI-6 level stuff, this is the sort of thing computer game players who don’t want to pay licenses fees and script-kiddies do every day on the web, no Russian help needed. Mark Boslough should probably stick to asteroids. given the fact that the Russian economy is heavily invested in fossil fuel development and export, I would think they would want the US to buy in on climate change and start curtailing fossil fuel production. Unless the world has moved on to another power source, in which case the last man selling oil is sitting on a vast reserve of nothing. MarkW, your assuming that Russia can’t use Russian oil or coal? Or the rest of the worlds reserve for that matter too, at a reduced price no less. If they want to keep on using coal and oil after the rest of the world has moved on to something better, more power to them. The gearbox oil in wind generators is going to be a gold mine when oil is scarce. Buy oil futures. Bingo. Makes sense to most of us, but then again, we’re not great sciency people without agendas like this dweeb. The Russians would more likely be funding the climate change alarmist movement so they can keep the price of their oil and gas high. A couple of years ago it was rumored they were funding anti-fracking movements. It’s been proven that the Soviets were heavily invested in the environmental movement before the Iron Curtain fell. Methane from cow farts started out as a joke too. ‘Mark Boslough should probably stick to asteroids.’ Cheese too? Putin is toasting each night with vodka and have a grand time laughing his head off, so little effort, such grand disruption of American politics. With little effort the SVB (KGB) and other Russian operatives managed to throw much of the west into disarray by playing on the internet with Facebook, Twitter, etc. They actually paid for the privilege. The Western media pick up the ball as did the Democratic Party. Russia interference has become the be all to end all for anything not going as they so desire. They turned Russia into the proverbial boogie man, to be found, according to them, under every rock, behind every tree, responsible for every conspiracies especially one’s countering the Leftist orthodoxy wherever it is found. Logic, critical thinking and better arguments were not working so blame it on the boogie man. Putin clearly dislikes the USA, blaming us for what he has said was one of the worst events in history, the dismantling of the USSR. Putting the West in disarray, especially politically, is certainly one of his strategic goals. Yet I doubt seriously he or his minions gave any thought to the happenings around Climategate. In fact he would love nothing better for us to destroy ourselves, our capitalistic system, which depends of abundant, inexpensive energy. Edwin, for my vote, you are ABSOLUTELY CORRECT! Russia [read: Putin] and ALL worldwide petroleum producers [read: OPEC and assorted dictators and tyrants] would love to STIFLE or DESTROY the USA horizontal-fraccing business! Of course, there is no way that I could “know for sure”, but, my money is on the belief that these international players are doing everything possible to stifle our [USA] domestic production miracle … and to boost the price of crude. Further, they may not be laughing — such would be a challenge for them, at this moment, given the current price of crude — but they are more than glad to spend such paltry dollars by which they can put so much negative political pressure on ALL domestic energy production efforts in the West. If they are laughing, it’s more likely because they know that they have PLAYED FOR FOOLS such a large segment of the West; and, they anticipate — and look forward — to doing it time and again. PS: for those who may believe otherwise, rest assured that Russia, OPEC and other assorted dictators and tyrants can hardly give a flying f*** about the environment. Smoke, smoke, smoke those funny cigarettes. Russia this. Putin that. The west has fallen apart because it chose to cut its own throat with multi-culturalism. Russia and Putin need not apply, they just walk away the winners. Look in a mirror if you are looking for someone to blame. I have no doubt Putin is doing his part in the downward spiral of “the West” but otherwise you are correct. Until we can get the majority of Americans to see the truth behind leftism we will continue to get weaker and poorer. Assuming our society even survives. The Western Media and the Democrat Party are actually aiding and abetting the Russian propaganda aimed at disrupting U.S. elections and dividing Americans one from another. Useful idiots, spreading Russian lies. The Special Counsel is supposedly now investigating Tony Podesta, the brother of Hillary’s campaign manager, John Podesta, about the Russian Uranium scandal. If the Special Counsel wants to find collusion between Russia and American politicians, the Democrats are the ones he should be looking at, not Trump. I want Congress to get Obama, and Hillary, and all the Obama department heads that signed off on the Russian Uranium deal to answer these questions: Why did you sign off on this deal? How did this deal benefit the people of the U.S.? I assume Hillary was in it for the money. I don’t know why Obama signed off on it although maybe he wanted to curry favor with the Russians for the Iranian nuclear deal he had in mind or some other reason. Otherwise, I can’t see why Obama would sign off on it. There’s no evidence he benefited monetarily. Yet. Wonder how many US servers and sites are used by all and sundry to disseminate opinions and data. If as much effort were put into finding US ‘involvement’ around the world I suspect similar Russian connections would be trivial by comparison. Just think of any cloud service. They can be used for the same thing. I don’t suppose anyone here needs reminding, but a standard technique for people who don’t want to be traced on the internet is to pass their activities through multiple machines. This makes it hard for the authorities to trace the original source, since they would have to go to each machine and examine it individually. To make things harder, the machines you should use should be based in foreign countries. Ideally, countries which do not have legal agreements with your country to pursue investigations through the net. So, if you are in the USA, don’t think that using a machine in the UK will stop the FBI tracing you. But, if you use a machine in Iran, one in China, one in North Korea and one in Russia, it is very unlikely that the FBI will gain the access they need to find you. This is why all the ‘attacks’ reported in the US seem to come from ‘enemy countries’. In Iran, all the hacking attacks are probably routed through the US, Switzerland and Denmark…. Don’t forget, DG. The leaked NSA hacking methods and tools detailed how to make a hack look like it came from a different individual or group as well as source country. At least before that leak many hackers, be they independent or national, had certain signatures (e.g., coding techniques, servers used, types and location of comments, etc.) that showed up in their hacks. After that leak, as far as I’m concerned, it has become nigh on impossible to attribute a hack. In fact, if a signature is in the hack it almost guarantees that is the one person or group that did not do it. The other consideration is that bootlegged software is very common in many of these countries and since it is not regularly updated, they remain vulnerable to even kiddie script hackers. Hadn’t thought of that – and I should of. Years ago i decided to try Tor for my internet access. First time I tried to pay my bills, I received an email from my bank saying someone was trying to access my account from the Ukraine. I quickly ascertained it was me. Decided that wasn’t really how I wanted to do my banking. Absurdistan is everywhere. And its Sheikh turns out to be a man of outlandish and Kafkaesque phantasy. We are also very likely to deny that cats are dogs, that the Earth is either flat or hollow, that two plus two equals anything other than four. Good fracking grief! There is one huge organization that benefits hugely from climate change policies. There is one organisation closely tied to the above that is the world expert on controlled disinformation and propaganda. FSB – the former KGB. I think the Democratic Party has taken the lead on this in order to hide their unprecedented corruption. Exactly my first thought. There is a pattern of this. I met Mark a few years back through a mutual friend. We had Dinner, and he seemed like a nice enough guy. Although we mainly talked about was asteroid impacts. My friend said that Mark has been working more and more on AGW type grants lately. Sounds like the classic paycheck bias coming out. There is no logic by which Russia would care to fund sceptics. If they believe in AGW then why would they discourage international action and if they don’t believe, why would they bother to stop western countries pouring money down the drain on pointless actions? I believe he is engaging in conspiracy ideation – perhaps Dr Lew could observe it in action? Can anyone help me trace all the money I’m entitled to from Russia and the Oil conglomerates? Wot? You don’t figure in the Paradise Files? You disappoint me …. I finally got a letter from the Koch’s the other day. It didn’t contain a check. It was a solicitation to donate to a cancer research effort. Oh, well, I live for the day the chack arrives. I noticed Boglug’s artful comeback: “Ka-ching!” Because we skeptics apparently get paid by the russkys whenever we post on a blog. Funny that nobody’s seen one red cent yet. Maybe it’s in quatloos. It was the Warriors that did it. Just don’t know where all this money came from. The Military Industrial Complex (MIC) is not making enough money. The $250 million per day fighting terrorism is not enough to pay the bills. What they need is a big war somewhere. Russia would be ideal. So they have put the word out to their minions (e.g. Soros et al) and they have forwarded the message to the useful idiots in Congress etc. 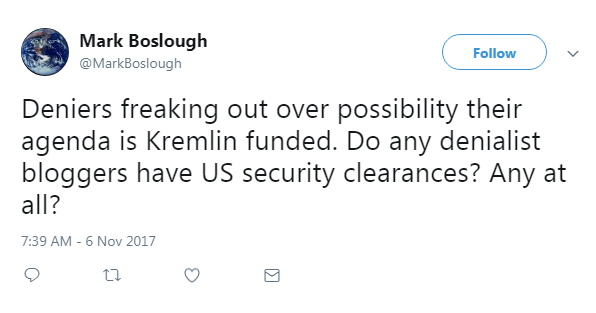 The current tactic is to make Americans, and others, hate the Russians so much that some kind of (expensive) military intervention is required. Then the MIC can sit back and reap the benefit. Do you get your aluminum hats wholesale? You need to replace your sarcasm detector. Your old one’s busted. You need the all new ‘Tesla Infinite Power Sarcasm Detector’ with optional facetiousness detector. ‘Musk AI’ and ‘Tesla solar battery power’ now bring the world the greatest sarcasm detector. Only $42/month (10 year minimum contract) other terms and conditions may apply. Mandatory for bogging in or about California. The last thing we need is a big war somewhere with a nuclear power. That’s a quick way to lose assets and marketing locations. What we need is a big war somewhere with a puny opponent…. Oh, wait, we’ve already done that with Saddam, Gaddafi, Afghanistan, ISIS… perhaps we need a ‘cold war’ with Russia again. I’ll phone up my contacts over there and see if they’re agreeable. It will be good for their budgets as well…. Author puts forth a stupid idea. People ridicule the stupid idea. Author then claims that the fact that people put for the effort to ridicule his stupid idea is proof that his stupid idea is correct. He may want to see psychiatrist soon. Could be schizophrenia or dementia. i say that because every time i say ‘libtard’, a transgender angel has an abortion. Yeah, it’s the same troll type tactic where they claim someone is a wife beater or child molester, and then when the accused defend themselves they cry “Me thinks you protest too much!” Very juvenile in my opinion. I have no respect for anybody that uses such puerile tactics. Just an observation, but whenever someone posts something really funny, they get a lot of responses. That’s a basic summary of most of the internet. It’s primarily composed of people shrieking for attention, since attention is a form of currency now. Of course this just encourages and rewards the worst sorts of people. Bizarre, as the Russians really are funding/spreading anti-Fracking propaganda in the UK. So it would be pretty stupid to undermine that by supporting climate change denial. Yes, the anti-fracking connection seems quite solid. A look at the usual suspects provides quite a clue. As if Russians had extra cash for CACA hobbyhorse. I don’t see any evidence at all that this man is intelligent. Studying hard and passing tests does not make a person intelligent. In fact, he is exclaiming all sorts of things that suggest the man is quite daft. We’ll probably find out soon that climate advocate cult clubs are being funded from the Kremlin because there is a clear pattern of psychological projection emerging. Smart is not the same as wise, and educated is not the opposite of foolish. Russian fuel industry has targeted their efforts by employing some socialist leaders e.g. German ex-Chancellor Gerhard Schröder and Finnish ex-Prime Minister Paavo Lipponen. It has nothing to do with intelligence; it has everything to do with politics. This just fits the same old pattern of “an enemy within and and enemy without – in collaboration” that has been used to control nations (through fear and suspicion of one’s own neighbors) for centuries. The anti-science corruption exposed by the Climategate e-mails was real. Russian collusion there – Nyet! Now the Uraniumgate ‘contributions’ to the Clinton foundation and Bill Clinton’s $500,000 ‘speaking fees’ correlating with the sale of US uranium assets to Russia… Da! If Mueller is honest, then Hillary and the gang look like they are in big trouble. The maybe she will shut up and leave the rest of us alone. I though I was going to get an oil czech, now its a russian ! He’s identified a person, and while I won’t share the name here, I can tell you it’s a person at UEA, not in Russia. Always the case. Anyone that has worked at such an institution knows full well that no hacking or conspiracy theory was required. Just a HDD. He makes wild claims like that without any kind of evidence and then calls people who disagree with him “deniers”. And this guy is supposed to be a scientist or something? Wtf. This is getting confusing. I thought we were all in the pay of western Big Oil. I just read that the Russians are paying green groups to work against fracking. Also read not too long ago that they paid for a documentary against fracking. Just in time for COP23 ! Would all the scurrilous emails have been collected for FOI purposes by a complicit FOI official? Even if they were hacked by the Russians (absolutely no evidence of that), all evidence points to the conclusion that the climate gate e-mails were accurate. This is all an attempt to use a false scandal to try and bury the real scandal. The contents of those e-mails. Much as the Democrats tried to gin up outrage over alleged Russian hacking of Hillary’s e-mails in an effort to avoid talking about the embarrassing contents of those e-mails. 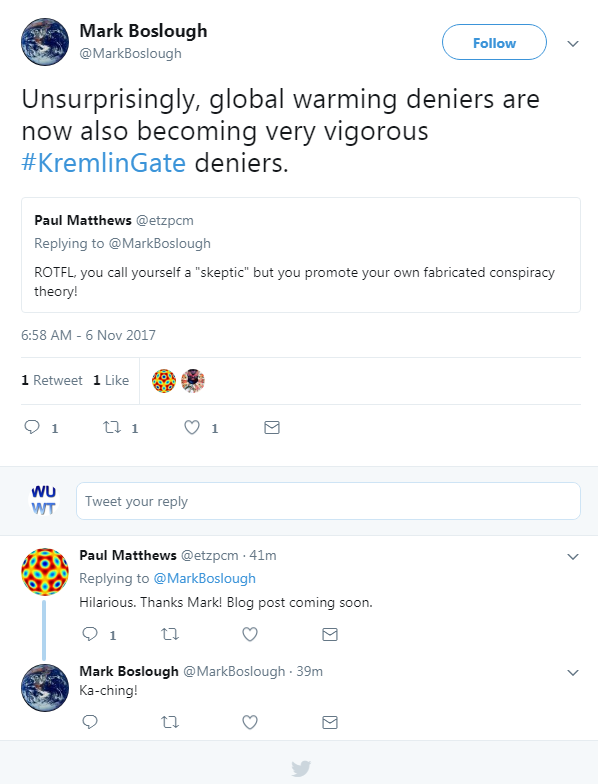 While Climategate was definitely an inside ‘job’ for all the reasons mentioned, that shouldn’t lessen any doubt that the Russians are hellbent on sowing discourse anywhere they can, because instability is the outcome they desire in the West. Thousands are employed in Russian troll farms writing comments in major newspapers around the world, with the only intent of stirring the pot. Sometimes writing opposing views and ‘arguing’ amongst themselves to make it look like a debate. You even see that here at WUWT from time to time, although I obviously have no direct proof. I think I can tell who is and am sure that Russian trolls are here in spades, since if this is the worlds leading website blog on GW/CC, then they would be fools not to be. Climate politics globally is a national security issue, and forming public opinion is the corner stone of that policy. Why do you think that the harmless, benign, life sustaining molecule CO2 has become the evil gas it has become? Destabilizing the West on energy policy has the ability to win a war from within without firing a shot. Always remember what Khrushchev said – “We will take America without firing a shot. We do not have to invade the U.S. – We will destroy you from within.” Putin has a long memory, and this is one of his most effective tools for the money spent. The fallback position for those who want their form of government (as long as they are in charge). Maybe it’s not a typo? Maybe it was Saddam Russain? Mark Boslough should have his tap water checked. When paranoiac fantasies start seeming real, Mark isn’t drinking plain water. Of course, radiator gin can cause the same effects. Anthony, while we talked early on about the possibility of an inside job, I, for one, arrived fairly early on at the conclusion that it was a hack by a climate blog reader. As I’ve mentioned occasionally, the attentiveness of Mr FOIA to Yamal documents proved clearly to me that he was a careful reader of Climate Audit, rather than the Russian intelligence service fantasized by climate scientists. I’ve reflected on what was gleaned at the time from metadata in documents and whether this illuminated attribution of the DNC hack (or at least Guccifer 2). Steve you are correct, I did forget about that email, related to the final dump of files aka Climategate3. Since both of us came to the conclusion that releasing those files into the wild would be counterproductive due to the volume of unrelated email that contained personal information, I had basically placed that incident out of my mind as it would likely become a “legal 3rd rail” if we released the entire cache. In retrospect, I remember thinking that his statement “…neither am I from the UK” said to me that he may simply not be a UK national, but may reside there. It’s hard to know with limited information. I do agree though, that because the first release of emails on Nov 17th was well filtered, Mr. FOIA had to have some “FOIA climate issues” knowledge with which to collate those first shocking emails. It’s certainly plausible that he was a reader of Climate Audit and perhaps other blogs too. Blaming the Russians for it is weak-minded and akin to a child caught making a mess in the house by a parent, and then pointing to his little brother and saying “Joey did it!”. So he was a reader of both CA and WUWT. From my perspective, the curation of emails into CG1 showed a keen knowledge of issues that I was interested in – it was evident to me that he was a regular reader of Climate Audit (and needless to say, WUWT). I don’t think that the term “FOIA climate issues” is apt in this respect, since the curation of emails had very little to do with FOIA requests at the time. Steve, perhaps it’s time for a recap, so that there’s a summary of everything known up to this point, for posterity. And I think you misinterpret (or I didn’t make sufficiently clear) what I meant by “FOIA climate issues”. I was referring to the entire ongoing argument over FOIA requests made by you and others that were being denied, something prominently featured at CA on a regular basis. Perhaps a better description would have been “ongoing cat and mouse game between FOIA requests and denials”. I saw this long ongoing process as an impetus for Mr. FOIA to do what he did. Let me add some other things. from the Russians, this story was dropped. Saudis: there was also a link back to a Saudi Server for the file drops. many long discussions with Steve Mc, I changed my mind. CA reader done it. These were basically 1 day use. Tracked him back to a machine in China for example. Hmm… I should look for the password to the last dump of mails. well, green, pacifists movement were notoriously kremlin funded and KGB supported, and certainly still are, so it make sense for them to pretend that that their own sin are not theirs, but their opponent. 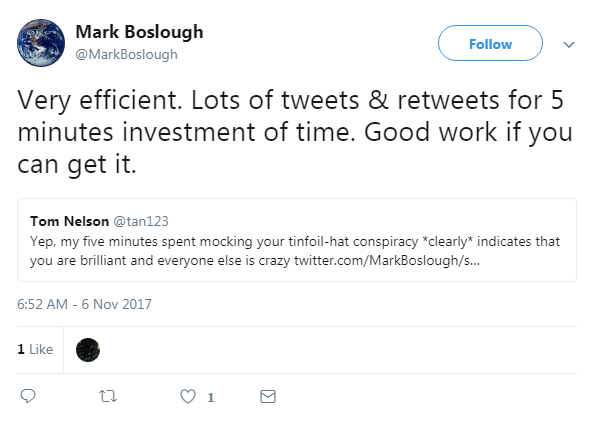 As an actual conspiracy theorist myself, I would find Mark Boslough’s argument pretty shameful to comprehend, given the argument wholly relies on fallacies; gross generalisation and ‘guilt by association’ fallacies, specifically. By arguing politicians have met Russians therefore they must be Russian inspired to oppose oil, perhaps Mark should consider how pro-climate change supporters, such as Barack Obama, associate themselves. Did he not go meet Saudi Arabians, known for their love of oil? Did he not order wars under questionable circumstances involving Libya and Syria over what many contend to be a battle over oil and gas pipeline supplies? Perhaps we should question Mark himself, an often visitor to Russia? Guilt by association fallacy is an incredibly easy thing to do, just ask Kevin Bacon and his six degrees, but it is logically worthless sans actual agreements or any sort of explicit evidence hinting as such. And I should know. I’m a conspiracy theorist.